“He almost looks like a puppy with all those whiskers,” you murmur to your friend. “A really HUGE puppy. . .” she whispers back. “Doesn’t he look like he’s smiling?” you ask. This monk seal encounter at Shipwreck Beach is just the cherry on top of an otherwise picture-perfect adventure for you and your best friend on this fascinating stretch of Kauai’s South Shore coastline. 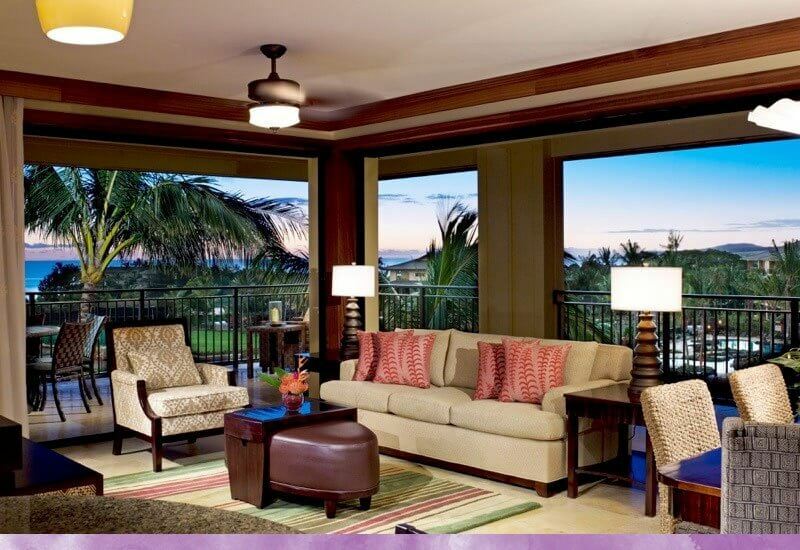 You’ve been staying the week in a luxury villa at Koloa Landing, and so far at the resort, you’ve enjoyed poolside cabana fun, a mai-tai happy hour under the waterfall grotto, yoga classes on the lawn, chef Sam Choy’s life-changing ahi poke, and lazy afternoons read-nap-reading on your sun-drenched lanai. But today you and your friend were ready for a little off-campus adventure. You got up with the sun, brewed a pot of local dark roast in your villa’s kitchen, and hopped into your rented jeep. A few minutes down Poipu Road you arrived at Keoneloa Beach — also known as Shipwreck Beach. You were smart to arrive early because you glided right into an easy parking place and wandered straight out to the sand. Someone had told you not to miss the famed Heritage Trail hike that starts at glorious Shipwreck Beach — and that someone had been right. This is what you came to Kauai for. Shipwreck Beach offers that dreamy tropical locale you’ve been craving: a huge expanse of golden sand surrounded by trees and towering cliffs. Thundering turquoise waves crush the shoreline. People are sparse. The beach’s sobriquet comes from a 100-foot wooden boat that ran aground decades ago and lodged in the sand just above the waterline. Over the years, storms have hit, covering and uncovering the hull from time to time, creating an eerie sight — like an old ghost of the sea that would appear and then fade. Locals differ on whether the rotting vessel was finally obliterated in 1982 by catastrophic Hurricane Iwa, or if it had simply been dismantled and removed that year. Some Kauains insist that parts of the boat are still buried deep in the sand. Though Shipwreck Beach is beautiful and appears idyllic, it is anything but for less-than-expert swimmers. Dangerously strong rip currents, rocky terrain, and a sharp shorebreak make the waters here notoriously treacherous. This doesn’t keep advanced swimmers, surfers, and body-boarders from hitting the waves in droves, however, but every year there are serious injuries (and worse) in these waters. The fact that there is no lifeguard adds to the risks. The flag flies red nearly every day. However, Shipwreck is a fine place for beachcombers of all kinds and is just plain perfect for picnics, sun worshipping, shoreline strolling, sunset gazing, turtle spotting and whale watching. From shore you can often see whales breaching in the distance, or tails flipping up from the surface as if waving hello to awed spectators. And of course, you may happen upon the occasional napping monk seal. A golden cliff to the left of the beach towers some 40 feet above the surface of the ocean. Harrison Ford and Anne Heche famously leapt from this peak in the 1998 movie, “6 Days and 7 Nights,” and locals and visitors alike tempt fate on a regular basis, jumping into the waters below. Don’t try this at home kids — or here for that matter. It is both against the law and extremely dangerous — for you and for the sea turtles swimming below. The Mahaulepu Heritage Trail begins at the north side of Shipwreck Beach and meanders all the way along the sea cliffs for several miles landing in pristine Mahaulepu Beach on Kawailoa Bay. User-friendly for all ages, this hike follows the coastline over cliffs, petrified sand dunes, caves, sacred grounds, a manicured golf course dotted with egrets, ancient cultural sites, Kiawe trees, colorful flora, thick roots, sandy slopes, lava rock, tidepools, petroglyphs, and all with awe-inspiring views. The cliffs overlook the Pacific Ocean that crashes against the rocks, sending sea spray skyward. These cliffs provide an ideal vantage point to spot humpback whales at play, so bring binoculars. The trail also offers additional paths that are further from the edge if you’re less fond of heights or just prefer something a little mellower. The main Maha’ulepu Trail is just under two miles (each way) but if you press on a little further you will be rewarded with the Makauwahi caves near the end. The caves boast lush, verdant grass. and tropical foliage and also contain prehistoric fossils dating back millions of years. (A taste of “Jurassic Park,” anyone?) On some days you can find naturalists at the caves ready to answer questions and point out some of the best sights — like the tortoises! A small army of the slow-and-steady green creatures can be spotted here most days. Brought in to replace the ducks and geese, they help eat up the non-native plant life that is threatening the ecosystem. If there are no rangers to point you toward the tortoises, pass over the little bridge beyond the caves and find four steps that lead down. Just don’t count on seeing a hare. Like on any hike, bring a buddy, water, sunscreen and a hat, and keep your eyes on the ever-changing (and often uneven) terrain underfoot. Also, parts of this trail are sacred grounds to be revered and preserved. As the locals say, “Take only photos and leave only footprints.” And let sleeping monk seals lie. . . . The Koloa Landing Resort concierge team is ready to offer tips on seasonal conditions, parking and how to get to this and other Kauai adventures.